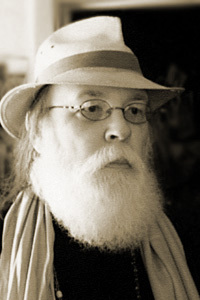 Norman Dubie is the author of twenty-three books of poetry, including the chapbook The Fallen Bird of the Fields from Goldsmith Fine Press (Zone 3, 2011), and The Volcano (2010), The Insomniac Liar of Topo (2007), Ordinary Mornings of a Coliseum (2004), and The Mercy Seat: Collected & New Poems 1967-2001 (2001), all from Copper Canyon Press. Dubie’s writing has been translated into more than thirty languages. He received the Bess Hokin Award from the Poetry Foundation, the PEN Center USA award for best poetry collection in 2002, and fellowships from the Ingram Merrill Foundation, the John Simon Guggenheim Memorial Foundation, and the National Endowment for the Arts. His book-length futurist work, The Spirit Tablets at Goa Lake, was published serially in three issues of Blackbird, beginning in Fall 2002 (v1n2), and can be found in our archives. Dubie teaches English at Arizona State University.